Karuna Cayton, a psychotherapist and practicing Buddhist, has written an interesting book for non-Buddhists who are looking for ways to make their life more manageable. Based on the 2600 year-old principles of Buddhist psychology, it covers the general range of the Four Noble Truths and the eightfold path, but in a fashion that does not require extensive knowledge — any knowledge at all, really — of Buddhist teaching and principles. The ideas covered in The Misleading Mind will not come as anything new to those who have even casually perused the Buddha’s teachings. However, in approaching them from the perspective of people with no knowledge at all of suffering and the causes of suffering as understood by Buddhists, Cayton has illuminated corners that may not have been examined even by long-term practitioners. 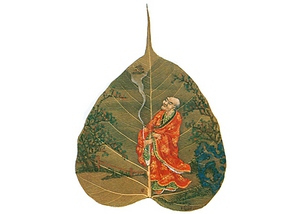 These principles are presented in a way that is accessible to non-Buddhists, and at the same time can profitably be considered by experienced students. Finally, unlike many writers, Cayton does not minimize the need for continuous, long-term work to effect the changes he promises. While reasonably gentle, he insists we understand that we are the “captains of our souls,” that we have to work for what we desire, and that the ultimate responsibility for our happiness rests upon — and just above — our own shoulders. 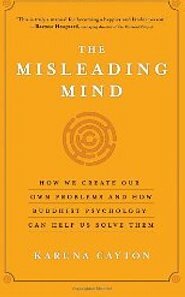 The Misleading Mind: How We Create Our Own Problems and How Buddhist Psychology Can Help Us Solve Them, ©2012 by Karuna Cayton. New World Library. Categories: Awareness, Buddhism, Mindfulness, psychology, Spirituality | Tags: Buddhist Psychology, causes of suffering, Emotion, Mind, Psychotherapy | Permalink. Science does itself a disservice if it pretends to be capable of answering all meaningful questions. Religion likewise sabotages itself when it dismisses findings of science in favor of pretty myths. To be truly powerful, both science and religion need to change and grow, hand in hand. Truth is more nearly to be found in unity of intellect and emotion, or unity of self and non-self. It is in that elusive place of balance where we become aware that the essences of things are not one way or another. White, David M (2010-11-26). Zen Birding (p. 9). O-Books. Kindle Edition. Categories: Church & State, Mindfulness, Religion, Spirituality | Permalink.